My husband is not a handy man. It’s not that he’s an idiot or a klutz; it’s just that, for the first thirty-five years of his life, he was quite content to leave home repair and improvement to others. He has no experience fixing things and—I am confident he would agree with me here—he does not appear to have a natural talent for DIY. But Ted married a woman who had to have a hundred-year-old house, a woman with special aesthetic needs, a woman not content to leave well enough alone when it comes to interior design. So, Ted occasionally finds himself scraping paint, or spreading plaster, or tackling a job that requires him to turn off the electricity to the upstairs. He had hoped that, as he gained know-how, he would also gain confidence, and, perhaps, develop some pride in his new skills. This hasn’t happened, really. Certainly, he’s relieved when he’s able to cross something off his list of home-improvement projects, but I think he still mostly wishes that there was a landlord or super taking care of things. Nevertheless, he perseveres, and I appreciate it. His latest achievement was the installation of a new light fixture in the nursery, one that would allow me to use my Tord Boontje lampshade. This project required getting on a ladder, stripping wires, a little bit of spackling, and the usual amount of cussing. It is, of course, easy for me to say that it’s all worth it, since I wasn’t doing any of the work, but, golly, I am just so pleased with the way the new fixture looks. I go into the nursery several times a day just to admire it. 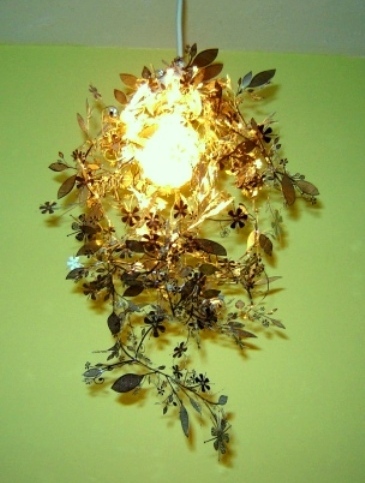 So, thanks, Tord Boontje, for designing such a clever, lovely lampshade. And thanks especially to Ted, for facilitating my decorating whims. You rock, babe.